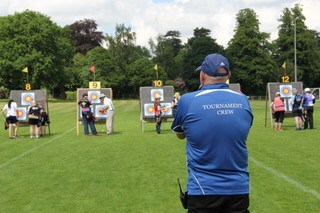 Volunteering at club level or at an Archery GB event, can be very rewarding especially in a sport that you love. Often people want to give something back to the sport they have enjoyed over the years so volunteering is an ideal opportunity. Each year we run and support many record status competitions. Volunteers have always played a vital part in helping us organise these events successfully, and without them our sport simply wouldn’t happen. Whilst it may be hard work, it gives you the opportunity to make new friends, to develop new skills and the chance to support the successful running of elite level competitions. * You may have to share accommodation. All volunteers will be given training and may shadow other volunteers. If you are interested in becoming a national volunteer then contact the Volunteer coordinator –vols@archerygb.org – stating which roles you are interested in. All roles are subject to change and roles will be given out as close to your preferences as we can. If you are interested in volunteering at a local level speak to your Club about opportunities in your County.